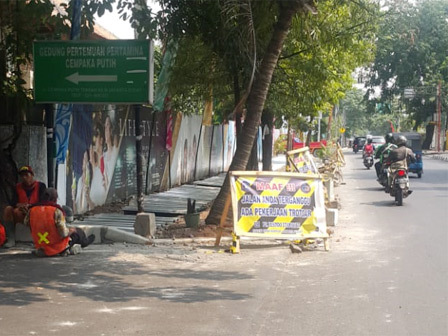 " The sidewalk will have 1,400 meters length with 2-3 meters width"
A sidewalk is being made on Jalan Cempaka Putih Raya, Cempaka Putih Urban Village, Cempaka Putih, Central Jakarta. It is purposed to follow up on public aspirations in Musrenbang 2017 and 2018. "The sidewalk will have 1,400 meters length with 2-3 meters width," expressed Sukowibowo, Head of Central Jakarta Bina Marga Sub-dept., Wednesday (5/30). It will be completed with box culvert, waterway and kanstine. Additionally, there will be polar at each end of the sidewalk to prevent the passing motorcycle. "Its development has been ongoing since early May and is targeted to be done November," he stated.